Powerful and user friendly Panel Studio editing software supports many PLC drivers. Good features include Fine components, Trends, Alarms, bar-graphs, Recipes, Multilingual. 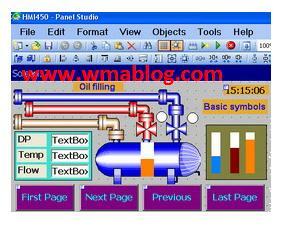 Scripts, Data logging, Remote Viewer Vector graphics, Symbol factory, Online/Offline Simulation for Rapid application development. · Lots of fine-made objects of Meters, Sliders, Digital LED, Check boxes, Combo boxes, Number Up/Down, etc. · Flexible to call many system functions from buttons, events, schedulers, scripts, etc.